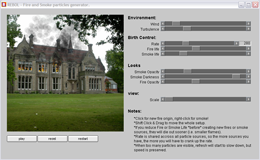 Fire and Smoke particles generator. 10 Jul 2009 Demonstration of GLayout's features and capabilities. 9 Nov 2012 Show how to do async event handling with processing loops.